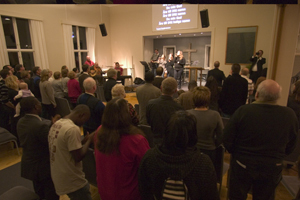 In the end of November Pioneer Mission together with the Salem church held its first missionconference, Vision for Mission 2008. The main speaker Richard Gunning from Northern Ireland preached about trusting God in times of financial difficulties, climate change and the stockmarket going up and down. Richard is the founder of ACE, an international network of about 50 campaign evangelists. Mikael Boman, the founder of Pioneer Mission preached about that we all can do something for Jesus. Han told how he got started in ministry, carrying the camera back for an evangelist during a festival in India. - The harvest is ripe, we have to reach our generation. Why should some hear the gospel twice, five times or ten times, when others haven´t heard it once? Let us do what we can. - There is a cry from many countries. The minarets are crying: "Come and help us!" You will only be satisfied when you are in service for God. We need to be serious with the Great Commission. - Have you heard of a farmer who only plows half of the field? No, he doesn´t give up until he is finished. - Oscar Schindler in the film Schindler´s list, was crying in the end, when he understood that he could have done much more so save the Jews. David Billström preached about finishing the race that we all have and not become tired. - There is one thing to start, but another to finish. - Paul ran with the focus on Jesus. Sometimes things can make us weary, but we have a crowd in heaven (in Hebr 11) who are cheering on us, and we can learn from them. Moses teaches us not to quit, Josef about not being bitter. David also explained that it is not just enough with passion. We also must have faith in God in all that we are doing. But we need to take up our cross in our lives. At the same time the life with Jesus is a privilige. - I am aloud to represent the King of kings. It´s a privilige. What are we waiting for? - I have never regretted that I have done a mission trip. Before it can sometimes be a struggle. He finished by showing three signals which are very obvious for believers. 2. Signal two: Follow me! 3. Signal three: The world is crying!